The Boxer dog names list is filled with names suitable for your new puppy. Some are associated with the breed’s look, like “Bruiser,” or “Admiral,” and others remind you of their dignified nature, like someone who is in charge, a leader, the head of the class, so to speak. Throughout history, many famous people and celebrities have owned one of these striking dogs. From Rocky Marciano, the famous boxer, to George Clooney, Charlton Heston and Sylvester Stallone. Visit our Famous Dog Names list if you are looking for more famous names. The Boxer dog names list has dog names that sound tough, like Brutus and Duke, stately or important, like Napoleon and Caesar, as well as many that I just like. Something to remember when naming your Boxer puppy is to match your dog’s purpose and personality with their name. You might want to choose from our list of famous dog names or one syllable dog names. Or maybe you want to name your new pup for a secret or personal reason, such as to remember a special person or time in your life. 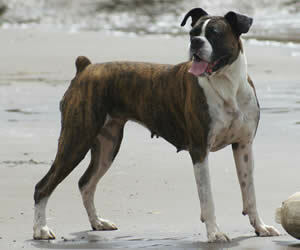 To learn more about this dog breed, visit our Boxer dog breed information page. It’s always a good idea to learn about temperament, trainability, and even a little of the breed’s history before deciding on a dog breed. It’s also fun. Below is a list of my favorite 101 Boxer dog names. Browse or study the list and have fun. If you don’t find a name you like, return to our Dog Names by Breed page to see more categories, or expand your search to our list of more than 4,000 puppy names. Admiral Commander in chief of a fleet of ships. Alex From Alexandra – Defender of mankind. Female equivalent is Alexis. Ali Muslim – Noble, Exalted. Also the famous boxer, Muhammad Ali (born Cassius Clay). Apollo Destroyer or Beautiful Man. Famous Name: Neil Armstrong was born on August 5, 1930, in Wapakoneta, Ohio. He is an Astronaut and the first man to walk on the moon. He earned his bachelor’s degree at Purdue University and later, completed graduate studies at the University of Southern California. Baby A young animal. An object or personal concern or indulgence. Bozo A dunce or fool. Bruiser A large heavyset man. Famous Name: Born on October 8, 1985, Peter Gene Hernandez or also known for his stage name: Bruno Mars, is an American singer-songwriter and record producer from Honolulu, Hawaii. Some of his hit songs are: “Nothin’ on You”, “Billionaire”, “Just the Way You Are”, and “When I Was Your Man”. Caesar Title for Roman Emperors – long haired. Famous Name: Gaius Julius Caesar was born on 12 July 100 BC in Rome. He is the son of Gaius Caesar and Aurelia. He became the dictator of Rome which paves the way for the imperial system. Caesar also became the Governor of Gaul. Chips A thin fried potato chip. Clyde Means “cleansing”. Can refer to a dog who is astonishingly clean. Cosmic Relating to the universe. Greatness, a cosmic force. Cuba Island country in the Caribbean. Cujo Aggressive and unpredictable behavior. Famous Name: Charles Darwin was an English naturalist and geologist born on February 12, 1809, in Shrewsbury, England. At the age of 16, he enrolled at Edinburgh University then became a student at Christ’s College in Cambridge after two years. He’s best known for his contributions to evolutionary theory. Duke Highest ranking nobleman – Leader. A favorite among Boxer dog names. Famous Name: One of the famous singer in 1950’s was Elvis Aaron Presley. He’s the son of Vernon and Gladys Presley. He was born on January 8, 1935, in Tupelo, Mississippi. His first hit single on the pop charts was “Heartbreak Hotel”. Fawn Submissive, pretty, and young. Named for females. Frasier A dog who makes you laugh with his antics, deliberate or otherwise. Freud Sexually-preoccupied, just like the famous psychologist. General High Army or Air Force rank above Lieutenant General. Governess A woman who teaches children in a private household. Guinness Brand of stout beer from Ireland. Hamlet Its origin is German and it means Hero. Hannibal A strong and determined general who invaded Italy. Harley From the hare meadow. Also short for Harley Davidson, a rather “tough” motorcycle. Holyfield A tough boxer who TKOed Mike Tyson. Homer Blind person or hostage, also means promise. Honey Sweet syrup produced by bees. Jabba Fat and lazy. Loves lounging around, not doing anything. Jack From John – God’s gracious gift. Famous Name: Jack Black is a 44-year-old actor, musician, and comedian born in Santa Monica, California. He attended the University of California at Los Angeles but was dropped-out to pursue his career. His acting career began with prime time TV in which he played roles on several shows such as: The Golden Palace (Taxi Driver), Life Goes On (skinhead), Northern Exposure (Kevin Wilkins, prom king), HBO’s Mr. Show, and Picket Fences (Curtis Williams). Jupiter Physically big, just like the planet. Also means “Father God”. Keeper Great name for a soccer player. Legend A romanticised story from earlier times. One who achieves legendary fame. Loverboy A seductor. Easily gets the ladies. Lucy Among famous Boxer dog names. Jodi Foster’s Boxer dog. Maestro Music master, composer or conductor. Mischief One that causes minor trouble or disturbances. Mona Lisa Beautiful and charming, yet mysterious, just like the famous painting. Mr T I pitty the fool that doesn’t like this name. For those who don’t know, that was one of Mr. T’s famous lines. Napoleon Lion of the woodland dell. Famous Name: Emperor Napoleon Bonaparte was a French military and political leader. He was born on the 15th of August 1769 in Ajaccio, Corsica. He was a reformer first before he became an Emperor. Napoleon is one of the greatest military commanders in his time. He died on the 5th of May 1821 in St. Helena. Niles Creative, muscular, and popular. Oscar Divine spearman – a fighter for God. Pluto The ninth and most distant planet from the sun. Prince Male member of a royal family. Rambo Fearless. A valient fighter. Rex The King. The all powerful monarch. Rose Beatiful and delicate, just like the flower. Shona Form of Jane – God’s gift of grace. Skipper Master of a ship. Sly One who is cunning, tricky and crafty. Short for Sylvester. Sugar Ray After the 1980s welterweight boxing champion.for the pet who likes to throw his weight around! Famous Name: Sugar Ray Leonard (born May 17, 1956) is considered one of the best fighters of all time. Aside from being a professional American boxer, he’s also a motivational speaker, and occasional actor. Sugar Ray retired in May 27, 1987. Sullivan Thinks of himself as the leader. Tank A large metal container. A heavily armed combat vehicle. T-bone A thick steak containing a T shaped bone. Tilly From Mathilda – Brave little maid. Tyson Son of the German. One of my favorite Boxer dog names. Warrior One who is experienced in battle. Woolf Greatly loves and greedily eats food. Xena One who is hospitable to strangers. Yogi Funny and spoiled. Goes his own way to get what he wants. Yummy Looks, smells, and even feels delicious. Zeus Father of the Gods. Zigzag Moves in a left to rught pattern. Unsteady on his feet. Can’t find the name you like on the Boxer dog names list? Don’t give up. Return to our Dog Names by Breed page to do some more exploring. If you have a great name, tell us about it!